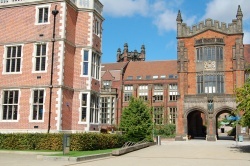 The Radiology Society of Newcastle Upon Tyne Medical School was established in 2012 by a collection of interested students. Based in Newcastle Royal Victoria Infirmary and the surrounding area, our aim is to assist learning and foster connections within the imaging world. We hope to promote interest in an exciting and rapidly developing subject with a wide range of opportunities. We offer teaching sessions led by consultants as well as by students and a number of speaker events throughout the academic year.